Perfect for guests or as a temporary bed. Whether you’re having guests over or need a temporary bed, an air bed is the best solution. Most people don’t have a spare room so it’s almost essential for every household to have a decent inflatable mattress on hand for this kind of situation. Comfort and reliability is essential to keep your guests happy, so here are 5 of the best air beds of 2018. Are you lacking in space in your bedrooms? Take a look at our 8 clever space saving beds as the perfect solution. 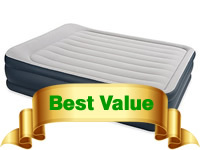 Weight Capacity – The maximum weight that the air bed can support without the risk of deflation. Inflation Time – The time is takes to completely pump up the air bed, usually via an integrated pump or a seperate included one. Pump Type – What type of pump comes with the air bed? Flocked Surface – Does the air bed have a soft and comfortable flocked texture on its surface? Built-In Pillow – Some air beds have an integrated pillow which is usually merely just a bump at the head to imitate the raise of a pillow. Includes Bag – Does it include a carry bag for when the air bed is deflated? If you’re lacking in bedroom space, you may also be interested in these 8 clever space saving types of beds. 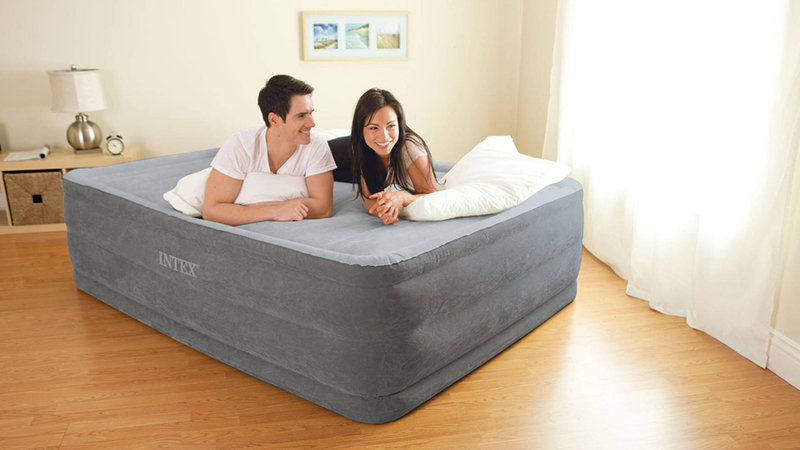 Intex manufacture perhaps the most popular air beds, particularly in the UK, because they offer great value for money. Inflatable mattresses are a versatile solution to many problems. They can be packed away and stored in a relatively small space, then set up quickly and easily when needed. They are an inexpensive alternative to sofa-beds for use at home, and they are also portable enough to take on camping trips, to festivals, or to a friend’s house for a sleepover. 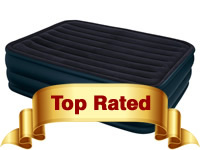 Shopping for an air mattress is easier when you’ve thought about your particular situation. There are many factors to consider when finding the best air bed, such as who will be using it, how often, and the space and budget available. Do you have enough floorspace to accommodate a double air bed, or does it make more sense to buy two singles and put them in two different, smaller spaces? Are you buying an inflatable mattress to cover all manner of situations, or can you buy a single air mattress, confidently knowing that you are only ever going to host one guest at a time? Make sure you are clear on the function of your air mattress so that you browse the right kind of category for the versatility you require. Single air beds start at around £10 with double air beds starting at around £15. If you’re looking for the ultimate in flexibility, try Campingaz Convertible Double or 2 Single Camping Quickbeds. They can be zipped together and apart for three different set-ups: two single air beds, one double air bed, or one single air bed but with double height for extra comfort. 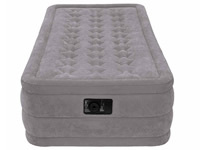 You can even buy junior airbeds, which are smaller than a traditional single mattress and typically have more raised edges to stop small children rolling off the mattress. These would be ideal for stashing away under the kid’s beds for whenever they have friends to stay, if they go camping with Scouts or Guides, or when they go to stay with their grandparents. Toddlers will love the fun and familiar design on the all-in-one Gruffalo ReadyBed, and it even includes the sleeping bag, making it a super easy option. For bigger kids, there are air beds like the Intex 66810, which comfortably accommodates children up to 8 years old. Because it requires setting up each time, you should think about who will be inflating the inflatable bed and what will suit them best. If it’s someone who is physically fit with time on their hands and they are guaranteed to always be around to inflate it, then you needn’t think twice about saving money with a foot-pump ‘manual inflate’ style air mattress. 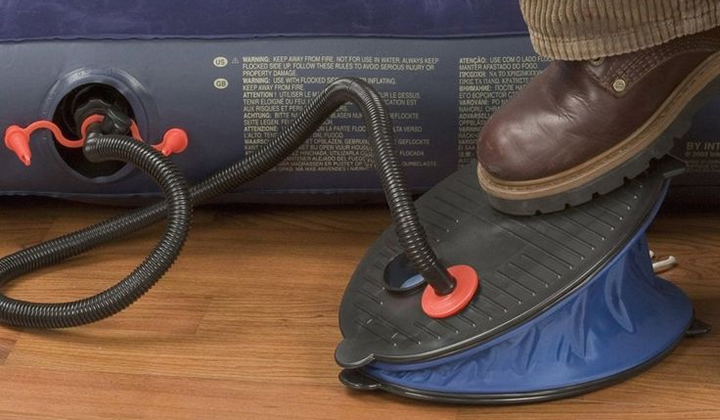 A manual foot pump for an air bed. On the other hand, if you know it’s sometimes going to be set up in a rush or needs to be inflated by young, elderly or generally less energetic or robust people, then a powered inflation option would be much better. Mains powered pump mattresses are still excellent value for money, and can save an enormous amount of effort; even a double-height mattress in kingsize width can be inflated in under 3 minutes! Additionally, many mains powered air beds will even deflate using the same system, making it incredibly easy to pack up and put away. Having said that, do check that your mains powered mattress can also be inflated manually if you’re in a pinch. It won’t be much fun in a field or a power cut to discover that you will be sleeping on the floor. Don’t forget that the whole purpose of an inflatable bed is that it is a place to sleep. If it’s lumpy and flat, it’s not much use to you so make sure you consider the comfort factor when choosing your air mattress. A double height inflatable mattress can be extremely comfortable as the extra depth keeps you far off the floor, avoiding that sinking feeling you might remember from the airbeds of your youth! They’re also much easier and more natural to get in and out of, which is an important consideration if it will be in regular use or used by older or less mobile people. Look at Intex mattresses for comfort, reliable and good value. If you’re looking for the ultimate in comfort then you can expect to spend more for something like the AeroBed Deluxe Raised Air Bed, which has five different settings for mattress firmness and feels as comfortable as a traditional bed to anyone lucky enough to sleep in it. It’s so robust that it can be used long-term so it makes an ideal solution if you need to put up a friend while their house is renovated or your cousins come to stay for a month or two every summer. Most of these premium aerobeds include a soft topping such as memory foam to add even more luxury to your slumber. Keep an eye out for clever “dual air chamber” features in doubles too. Beds such as the Coleman Comfort Double allow you to inflate each side to a different level of firmness ensuring that each person sleeps comfortably (and is less likely to bounce the other sleeper into the air when rolling over!). Some of the best air beds are made by Aerobed. Here is a brief video showcasing their Comfort Superior Raised King with Headboard. Actually, for many people it may just be for Christmas because that’s when lots of us have an influx of visitors! That point aside, you still want your airbed to last a good amount of time. Look for double lock valves to prevent air leakage and dual layer designs on the mattress itself to make punctures less likely. Materials such as vinyl and PVC are helpful at keeping moisture out of the bed which is ideal if you will be using the mattress in a tent or young children will be sleeping on it. Having said that, check that there is a flocked surface on top for comfort; you don’t want to be brushing up against rough plastic when you’re trying to sleep. Your airbed is made to be stashed away, so think carefully about where you will be keeping it. Some air beds come with a storage and carry bag which could prove useful if you’ll be using the air bed out of the house and on-the-go. If you need to buy multiple air beds (e.g. one single in each kid’s room and one double for visiting guest) then it makes sense to buy air beds with separate pumps. 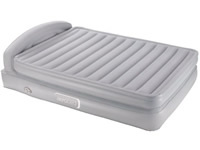 If you only need one air bed, you might as well go for the convenience of a bed with an inbuilt pump. However, choosing this option with multiple beds to store will take up an unnecessary amount of space. 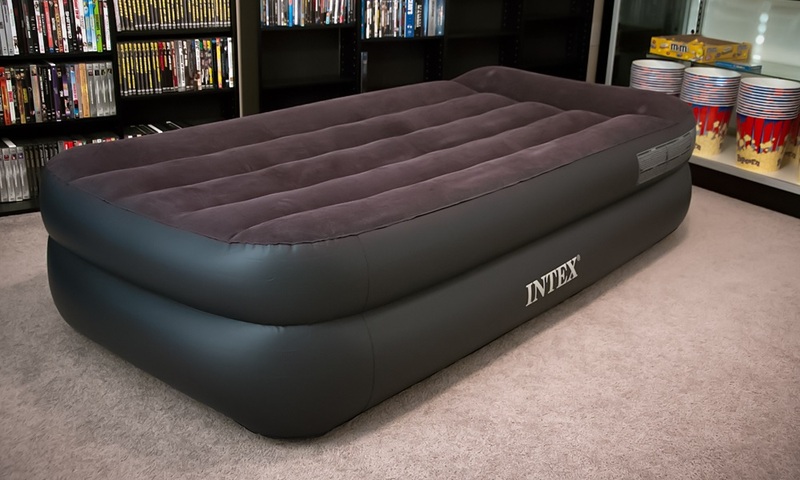 Similarly, if you are buying air beds for camping, it might be easier to go for individual single air beds without pumps built in to save on unnecessary bulk and weight being carried around. While it’s probably not a primary consideration, you may still have certain criteria for the appearance of the air bed. Most manufacturers are aware of this and tend to avoid lime green and fluorescent orange, but if the air bed will be a regular feature of your home, you might want to shop for particularly neutral colours or those which fit in with your existing decor. 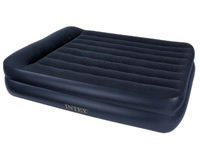 Typically, inflatable beds come in navy blue, cream, black, grey, khaki, or any combination of those colours. So there’s a lot to think about when it comes to choosing the best air bed for you and your needs, but be assured that the right product is out there for you! The ideal air bed is comfortable, durable and quick to inflate, but the specifics on size, colour and budget come down to your own needs and preferences. Sweet dreams!